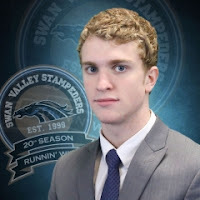 Merek Pipes (pictured above) made 43 saves for his 4th shutout of the season to lead the Swan Valley Stampeders to their 5th straight win, a 1-0 decision over the Portage Terriers. Matt Osadick netted the OT winner just 21 seconds into the 3rd period to help the Stamps pull within 6 points of Portage for top spot in the MJHL standings. Ethan Peterson made 33 saves in the Terriers' net to get the overtime loss. The Stampeders' will continue their home-stand next Saturday night when they entertain the Winkler Flyers. The Wayway Wolverines had their 3 game winning streak snapped on Saturday, losing 3-0 to the Winnipeg Blues. Jeremy Link made 25 saves to earn the shutout while Jayson Szun, Braeden Binda and Nathan Adrian scored for the Blues. Isaac Labelle in the loss turned aside 35 of 38 shots. The next game for the Wolverines will be on Thuursday night when they host the OCN Blizzard. Puck drop will be at 7:30. Kyle Bosch, Tyler Traptow, Brandon Borberly, and Caden Benson scored while Zach Johnson made 23 saves to lead the Kindersley Klippers to a 4-1 victory over the Melville Millionaires who had their 3 game point streak snapped. Nash Wood's 1st SJHL goal was the Mils' only offence while Colby Entz turned aside 35 shots in a long cause. The Mils who still sit 3 points up on Weyburn for the final playoff spot will return to action on Friday night when they visit the Estevan Bruins. The Yorkton Terriers' win streak now sits at 3 games after a 9-1 defeat to the Battlefords North Stars. Brett Gammer (3G 1A) and Dylan Esau (2G 2A) led the North Stars with 4 points each to lead them offensively. Branden Klatt scored the lone goal for the Terriers in the loss. The Terriers will return to the ice on Tuesday night when they host the Estevan Bruins at the Farrell Agencies Arena. Yorkton will go into the matchup, 4 points back of the Bruins for top spot in the Viterra division.